Sat soft on the hardwood ?? Subtle is a band from Oakland, California. They remixed "Farewell Ride" for Beck (or more specifically, it seems to have mostly just been Doseone from Subtle). The track contains some non-Beck singing (the italicized parts above), which was mainly a quick rap that Doseone added and which I didn't try too hard to decipher. The melody is chopped up somewhat, and some trip-hop beats are added. 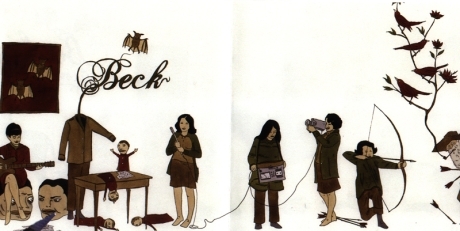 Initially, this remix was made available on beck.com as a (sort of) (hidden) download, around the time Guero was released in 2005. It was released officially as the "Farewell Ride" remix on Guerolito. Please check out this site, about one of the members of Subtle.